Road salt is used during winter on urban streets and pavements to prevent accidents on ice and snow. The salt enters the soil surrounding the roots via melting water where the high salt concentrations damage fine and young roots. This is a great challenge for trees because this strongly reduces water and nutrient uptake. Later, damages can also be observed on tree crowns as leave margins turn brown (leaf necrosis). Consequences are also a later budbreak in spring, a premature cast, slow shoot increments, shoot dieback, and complete dieback. In the 90ies, road salt was applied more cautious leading to less damages on trees. But since 2000, in spite of a less harsh winter climate, the negative effects increased again. 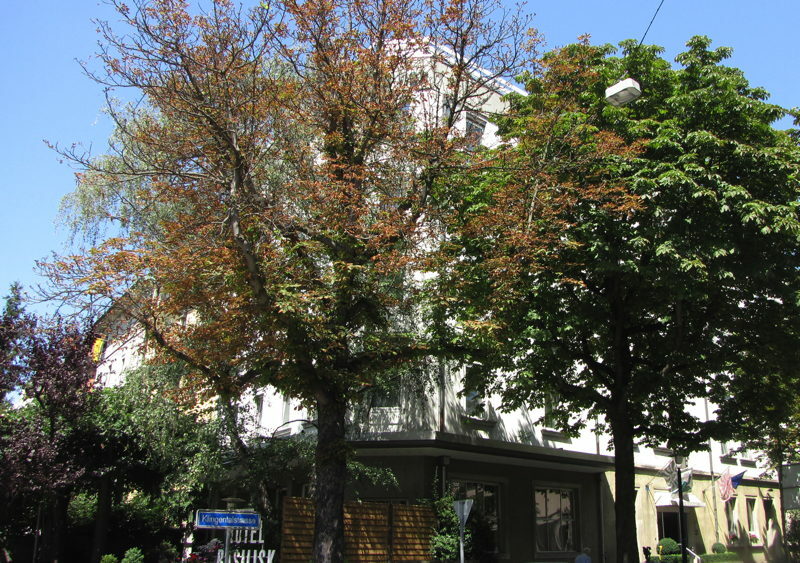 In 2012, salt damage was recorded on 1000 trees of 39 different species across the urban area. 32.2% of the trees showed typical leaf margin necrosis and increased concentrations of chloride (threshold for salt damage: 4mg Cl / g dry mass), regardless of the species. An increased salt load exists near drives, pedestrian crossings, bus stations, and in tree grids with raised edges where rainwater cannot enter and dilute salt content. Strong or frequent rainfall in spring can wash away road salt and decrease negative effects. Tree mortality is clearly increased with salt damage. 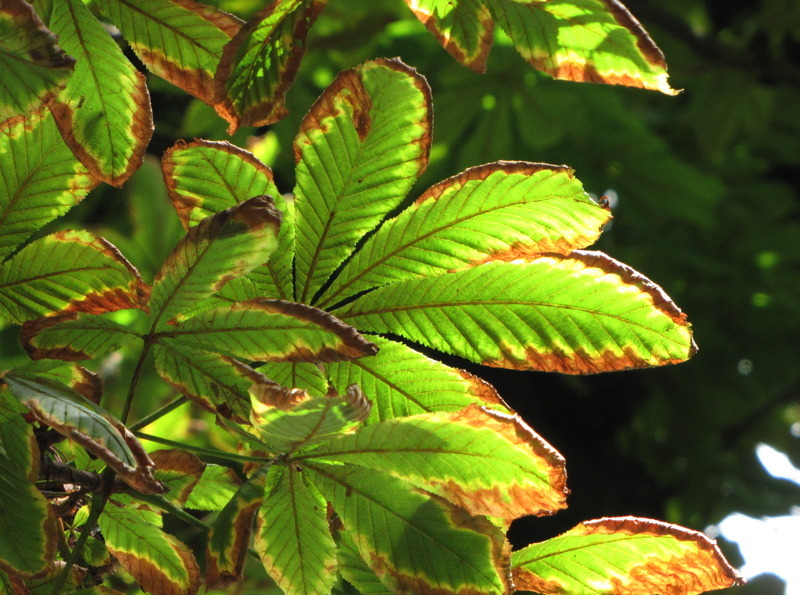 From five horse chestnut trees, which were recorded to be strongly salt damaged, three died within the next three years. Also Turkish hazel, maple and linden died more frequently due to salt damages. Temporal development of leaf margin necrosis due to road salt in maple. Trees with increased salt damage have increased chloride concentration in foliage. The dashed line indicates the threshold for salt damage, 4mg Cl/g dry mass. In Basel, in tree species showing salt damages, stem increments are smaller. And increments are already smaller at minor salt damages (score 1). modelling. The effect of salt is significant at p<0.001.